Back to school is a good time of year to get back to routine with three meals per day and two to three snacks. Start the school year off strong by packing a lunch for kids to take to school. Investing in an insulated lunch bag and lunch containers gives you more flexibility with what you can pack. However, it is still important to find out where your child’s lunch is stored prior to lunch and always include one or two ice packs or frozen water bottle to keep perishable foods cold. Aim for four food groups in lunch, always including fruits and vegetables. A well-balanced lunch is essential for getting kids through afternoon classes, activities and sports with success and ease. If your kids are sick of the same old sandwich, switch things up by using whole wheat pita pocket or whole wheat flour tortilla instead of typical bread. Swap out mayo high in saturated fat for mustard, hummus or guacamole. Peanut butter sandwiches are a classic and do not require refrigeration! Reduce the sugar and boost the nutrition by using a whole banana, fresh strawberry or apple slices instead of jam or jelly. Make your own lunchables using whole grain crackers, string cheese, apple slices and baby carrots. A variety of fruits and vegetables can work in a home made lunchable, such as sugar snap peas, berries, cucumber slices, grapes and celery. While the weather is still warm during the first couple months of school, pack frozen fruit. It will be ready to eat, but still refreshing at the lunch hour. 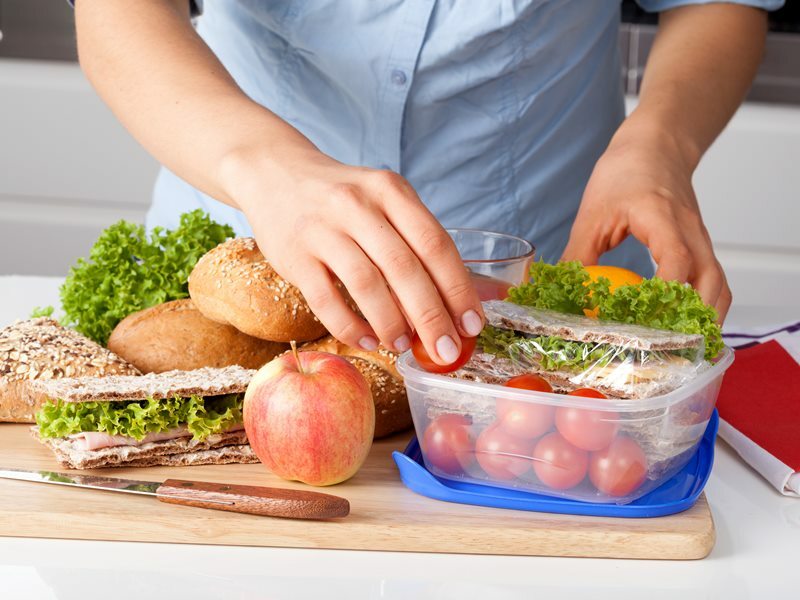 Right now, packing lunch might feel daunting, but over time you will develop a system and become more efficient.